“Fires Continue to Plague Historic Forts” is the headline in the most recent number (318) of Headquarters Heliogram, the Council on America’s Military Past newsletter. The article then details damage to structures at Fort Wayne (Indiana), Fort Niagara (upstate New York), and Fort Mifflin (near Philadelphia) over the past year. In my own backyard, the 6.0 American Canyon earthquake in August damaged several historic buildings – including the Museum and the main hospital structure – in the Mare Island Navy Yard historical area of northern California. The Heliogram article closes: “Fires and vandalism [I’d add “nature and neglect”] seem to be a constant threat to historic sites. While some have around-the-clock security or alarm systems, many do not due to technical or financial challenges. Making repairs also costs money and many sites don’t have adequate insurance or reserves to cover the cost of [repairs of] damage.” City and other governmental agencies are often as dangerous to our history as “fires and vandalism”. 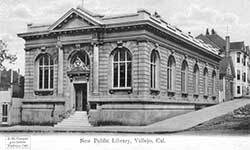 My own city of Vallejo saw the wholesale destruction of historical structures – including a lovely and iconic Carnegie library – in its haste for urban renewal in the late 1960s. Carnegie Library Vallejo CA. Interior. Image Courtesy Vallejo Naval and Historical Museum via http://www.carnegie-libraries.org/california/vallejo.html. 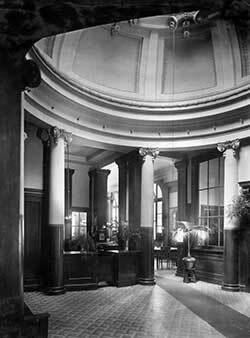 Opened in 1904, it was demolished in an ill-advised flurry of downtown urban renewal in 1969. And so we see that the inevitable result of the insults of time, nature, people and events – plus the lack of resources or interest to restore, preserve and protect them – is the gradual degradation and disappearance of the most compelling records of our history – the physical evidence as represented by structures and landscapes. So, what should historians – professional, academic and amateur – do? Second, historians need to “sell” history to a public very interested in their past. Lectures given at libraries and museums are a natural. Lectures given to local service clubs like Rotary or Soroptimists deliver a message to community business and professional leaders, people with influence and money, people for whom “getting things done” is a way of life. Want to raise money or workers to restore a local icon? Get the Rotarians involved! Another way to deliver history to the public is by being a docent at a museum, park or historic site. Docents make history come alive by their enthusiastic and knowledgable story telling and explanations. My personal favorite is giving walking tours of historic sites; there’s something compelling about walking in the steps of the people who were part of the history you’re telling. Third, historians need to become involved in the “politics” of restoration/reservation/protection. This may take the form of serving on the Commission that’s responsible for overseeing a community’s heritage or landmarks. Historians who give testimony or who advocate for preservation bring powerful and respected voices to any discussion about preserving our past. I know a local historian who quite literally single-handedly faced down developers and sympathetic local legislators to preserve a significant historic resource that was just weeks from being demolished for a construction project. (She gives credit to the historical society, but the reality is, she was one person – tenacious to be sure – who saved an important historical resource.) Public advocacy works! Finally, historians can learn how to establish tax-exempt foundations to support preservation efforts of important resources. It’s easy to do – Nolo Press publish a handy go-by that really works. I know because I’ve set up three 501(c)(3) non-profits using their publication. Of course the non-profit corporation is just the first step. After that, you have to go out and beat the bushes for money. See steps two and three above. And recruit friends, colleagues and relatives to help out! There you have it. Historians working to preserve our past by researching and publishing it, by selling it to a public hungry to know more, by advocating for restoration/preservation/protection at a local governmental level, and by raising funds for those efforts. No small order, but committed action does get results. Tell us what you have done in your community. Give us your best ideas and best practices for restoring/preserving/protecting our past. Post your comments and I’ll make sure our readers see them.